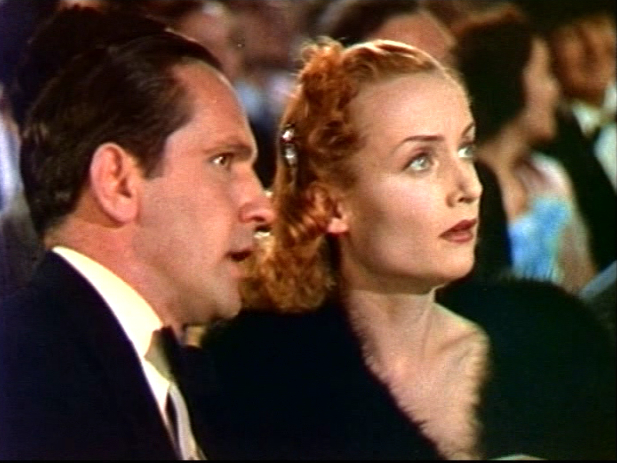 Nothing Sacred is an American Technicolor screwball comedy film directed in 1937 by William A. Wellman, produced by David O. Selznick, and starring Carole Lombard and Fredric March. with a supporting cast featuring Charles Winninger and Walter Connolly. Ben Hecht was credited with the screenplay based on a story by James H. Street, and an array of additional writers, including Ring Lardner, Jr., Budd Schulberg, Dorothy Parker, Sidney Howard, Moss Hart, George S. Kaufman and Robert Carson made uncredited contributions. The lush, Gershwinesque music score was by Oscar Levant, with additional music by Alfred Newman and Max Steiner and a swing number by Raymond Scott’s Quintette. The film was shot in Technicolor by W. Howard Greene and edited by James E. Newcom, and was a Selznick International Pictures production distributed by United Artists. In 1965, the film entered the public domain (in the United States) due to the claimants’ failure to renew its copyright registration in the 28th year after publication. This was Lombard’s only Technicolor film. She stated that this film was one of her personal favorites. New York newspaper reporter Wally Cook (Fredric March) is blamed for reporting a Harlem bootblack Ernest Walker (Troy Brown) as an African nobleman hosting a charity event. Cook claims he was unaware, but he is demoted to writing obituaries. He begs his boss Oliver Stone (Walter Connolly) for another chance, and points out a story about a woman, Hazel Flagg, dying of radium poisoning. Cook is sent to the (fictional) town of Warsaw, Vermont, to interview Flagg (Carole Lombard). Cook finally locates Hazel, who is crying both because her doctor has told her that she is not dying and because she realizes she might be stuck in Vermont for her whole life. Unaware of this, Cook invites Hazel and her doctor to New York as guests of the Morning Star newspaper. The newspaper uses her story to increase its circulation. She receives a ticker tape parade and the key to the city, and becomes an inspiration to many. She and Wally fall in love, and he asks her to marry him even though he still thinks she’s dying. After a medical exam by three independent doctors it is finally discovered that Hazel is not really dying, and city officials and Stone decide that it would be better to avoid embarrassment by having it seem that she went off to die, “like an elephant”. Hazel and Wally get married and quietly set sail for the tropics. The first screwball comedy filmed in color, Nothing Sacred also represents the first use in a color film of process effects, montage and rear screen projection. Backgrounds for the rear projection were filmed on the streets of New York. Paramount Pictures and other studios refined this technique in their subsequent color features. Ben Hecht is credited with writing the screenplay in two weeks on a train. He adapted the story “Letter to the Editor” by James H. Street which had been first been published in Hearst’s International-Cosmopolitan. Hecht wrote a role for his friend John Barrymore in the film, but David Selznick refused to use him as Barrymore had become by then an incurable alcoholic. This caused a rift between Hecht and Selznick, and Hecht walked off the picture. Budd Schulberg and Dorothy Parker were called in to write the final scenes and several others also made contributions to the screenplay, including: David O. Selznick, William Wellman, Sidney Howard, Moss Hart, George S. Kaufman and Robert Carson. One reason that the film is considered among the most celebrated screwball comedies is that underneath the humor it incorporates sharply cynical themes of corruption and dishonesty. This film, along with Hecht’s The Front Page (1931) and its 1940 remake His Girl Friday with Cary Grant, caricatures the chicanery to which some newspapers resorted in order to get a “hot” story.